Hats, long coats, jeggings and stylish sunglasses have made their way back into fashion. People like to tie their shirt round your waist. In recent years, trends typically involved wrapping shirt around jeans. Tying shirt around waist is the signature style of 90’s. Fashion varies and it is about changing and renewing old trends in modern way. Are you tired of this fashion of tying shirt around your waist? Try trend of tying your shirt around your shoulders. The signature look of tying shirt around waist has now been replaced by new fashion of tying shirt around your shoulders. However, this fashion is not new but it has made its way back into fashion with some modern and trendy styles. Rock this new trend of draping shirt in a new way around your shoulders. Be stylish yet casually in modern way. This is not common to swing your shirt around your shoulder. You can rock this style from swooping it around the neck to draping it to the side. You have to be careful while dressing up this way. Not only shirt, you can also drape sweater around your neck. Pay your attention on the color of the shirt you are going to drape either choose bold color to make it pop or match it with color in your outfit. Striped sweater or shirt looks great when drape around shoulder. But you can also try other prints and patterns too. 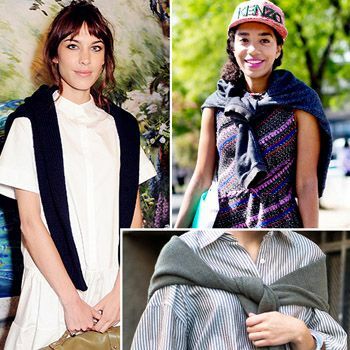 The style of shirt draped around the shoulder got an even trendiest seal of approval from a model.Model spotted in street of Paris who swung a striped sweater around her shoulder while kept rest of her look simple. For grungy look, grab a biker jacket along with beanie. It’s key factor to achieve this new style with new trick. This tricky will make you a perfect street style model. Heels with tight black jeans will create a dynamic and grungy look. One of tricks to adopt this style, do it casually and effortlessly. What a nice way to combine a chunky sweater with trendy shirt and pair of denim. Pick up a chunky sweater and wrap it around your shoulder while arms of sweater will fall on front of your trendy shirt. School boy look is always captivating. For this ensemble, toss a sweater on striped boyish dress shirt. To get the perfect school boy look, know your sweater tightly in the center and scrunch it down over your shoulder. Make sure to match the hue of sweater to dress shirt to get harmonized boyish look. Go for long sleeve shirt around shoulder instead of sweater for a formal look. Pick a bold and bright color long sleeve shirt and scrunch it down on one of shoulder. Completely transform your dress into a formal wear with this simple yet effective stylish piece. Colorful top and shirts with denims and jeggings are such a statement pieces on its own and adding shirt draping around shoulder make these styles even more eye catchy and attractive. So what are you waiting for? Find out a shirt or sweater either from your wardrobe or market to drape around your shoulder and look stylish and trendy. Of Course Suri Cruise Won’t Have Her Own Clothing Line!